Do you still remember playing Tetris for hours and hours twenty years ago? Or are you so young that you have never heard of Tetris? In both cases you might like to try Tint - it is a free clone of the classic game from behind the Iron Curtain. 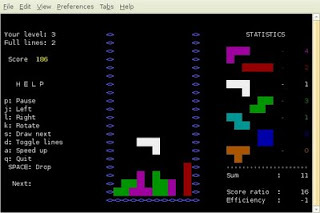 There are numerous versions of Tetris available for any moder Linux system. But Tetris was not a 3d game nor was it played with hexagons, or over Internet or LAN against a human opponent. On the contrary, it was a very simple game with extremelys simple graphics. Just like Tint today. Tint was meant to be a close clone of the original Tetris written by Alexey Pajitnov, Dmitry Pavlovsky, and Vadim Gerasimov. Tint is a very lightweight game and it does not take a lot of hard disk space. In fact, the size of the deb package is only 14.1 kB (I had of course ncurses preinstalled). Could this be the smallest arcade game available for Linux? wow, i'm really amazed. even in game community they don't mention Dmitry Pavlovsky and Vadim Gerasimov anymore. even in medvedev's russia, where i'm from. will try the game right away. thanks.